Macrame Luxury Masquerade Ball Mask - Gold is painted in antique gold and adorned with ornate designs and Faux diamond crystals. Stunning mask for men or women. 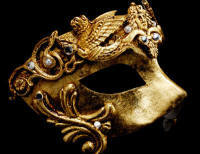 Bring a little Venetian charm to your masked special occasion in the Macrame Luxury Masquerade Ball Mask in gold. 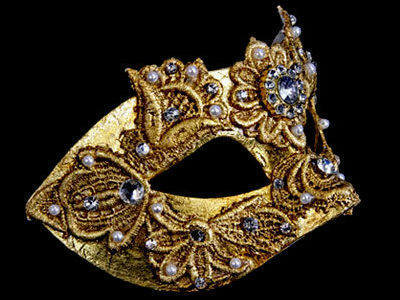 Wear this opulent and authentic mask and you’ll see why these luxury masquerade party pieces are so popular every year in Venice at Carnival time. Richly adorned in aged style features, the Macrame gold will add a touch of extravagance to your masquerade costume. Nestling among the gold macramé is an abundance of faux crystals, set to gently sparkle around your face. It is no wonder that mask making continues today in Venice. With the dexterity for creating such beautiful pieces, there is high demand for these real Venetian masks both at Carnival time and for masked balls around the world. We are delighted to bring you these original works of art, straight from the workshops in the alley ways of Venice to your own masquerade ball or special occasion. The Mascherari, or mask makers of Venice, make these masterpieces using the techniques employed in the 16th century when the annual Carnival of Venice was its most popular. For the people who visit the Carnival, perhaps for just once during their lifetime, to wear real Venetian is something spectacular. To replicate that splendour at one’s own ball or party makes the occasion extra special. 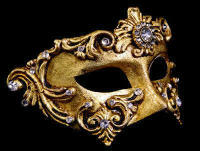 How does it feel to wear one of these Venetian masquerade masks? Surprisingly light. Thanks to the traditionally hand crafted papier mache base on which the macramé detailing rests, the mask is luxuriously comfortable. And with satin ties keeping it in place, you’ll forget it’s there. Nothing has bettered the traditional making of Venice’s handmade masquerade masks. And for this reason, the City’s craftsmen continue to practice their skill in the techniques used for centuries. Crafted with care using only the best materials, you’ll love wearing the Macrame luxury mask. Enjoy your party. Have this luxury mask today.